The LED Distribution Control Panel, is rated AT A TOTAL of 5 Amps maximum. This includes all the switches on the panel and the main on/off switch. The control panel will work fine as is with any Neon or LED lighting kits on the market for automotive applications. The panel has been successfully tested with 8 lighting kits connected to it which included one neon undercar kit, one led undercar kit, two strobe lights, one black light, and 3x 10" interior neon tubes totaling approximately 3.5 amps. Just be sure that whatever you install on the panel that the kits draw NO MORE current then 5 amps in total. You can check the current rating of your light accessories by looking for amperage ratings on the kits or by contacting the dealer you purchased them from. In order to be able to run MORE accessories from the control panel that "may" draw more then the current rating of 5 amps, you will first need to know the current rating of each individual accessory. 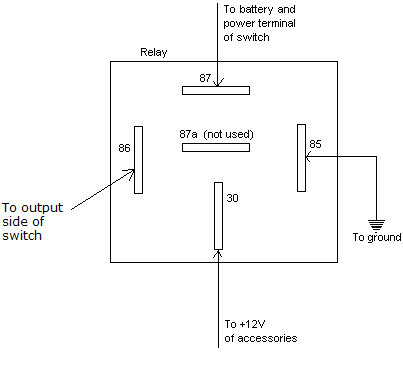 If these accessories, in TOTAL, uses a current rating higher than that of the switch panel, then you must use a relay to provide the current needed. We'll show you how to install a relay. However, all Neon and LED kits on the market today for automotive applications will work fine with the LED Distribution Control Panel as it is now, and without the need for relays as stated above in the second paragraph. But strobe lights for example tend to have a higher current rating then that of neons or LED, (led's being the lesser of the three) so you will need to know the current rating for strobe lights in this case to determine if you need to use a relay or not. If the TOTAL current draw for ALL the lighting accessories is LESS than the maximum current rating of the control panel, then you will NOT need to install a relay. Simply run a power wire directly to the positive terminal of the battery going to the control panel. We advise putting an in-line fuse holder at the end of the wire closest to the vehicles battery, no more then 18 inches away, and use a 5 amp fuse to protect the control panel and wires. If the current draw for your accessories TOTALS MORE than the current rating of the control panel, then you will need to add a relay. Most automotive relays are labeled with their amperage rating in DC Amps. 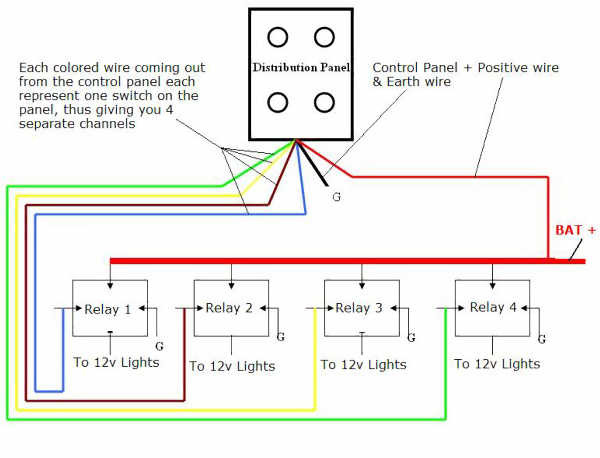 Having said that, lets suppose your running 8 light accessories off the control panel, 2 accessories from each switch on the panel, and they are all drawing more Amps then the TOTAL current rating of 5 amps, then what you'll need to do in this case is wire the panel to the relays according to the diagram below. Run a "thick gauge" power wire for the relays directly to the positive post of the battery, putting an in-line fuse holder at the end of the wire closest to the battery connection. As a side note, you can hook up MORE then 2 items per channel to the control panel if you wish, just be sure to get the correct relay to handle the TOTAL current draw (Amps) of each light kit. You then need to connect all of the positive power leads of the lighting accessories to the power terminals of each relay, as shown above and connect all of the ground leads for the individual light accessories to a common chassis ground. Lets say you just want to hook up ONE relay to ONE of the switches on the control panel, then simply follow the "how to install a relay" diagram above, and wire it in the same way as described, but only for one relay.